-> NV_TURRET_RIGHT NV_TURRET_LEFT and are in "Marker Mode" does not return a value (1 or 0). When robots with fixed camera (without pan servos) can thus no automatic localization can be performed. the "Navigation by map" it works! -> The control over NV_FORWARD, NV_BACKWARD etc. 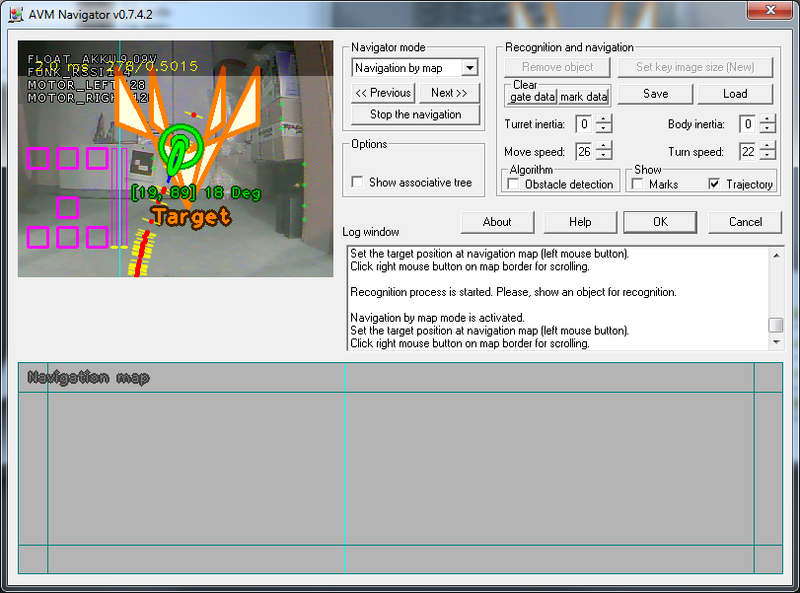 and the settings Body-Turn inertia looks for some robots too fidgety (nervous). Here it would be good if the integration speed (eg, 128 to 255/128 to 0) variable could be set. Better here would be a PID or at least one PI control, the jerk to the robot adjusts slowly without. -> it would be advantageous if the file would get ordener for AVM File. If a file in its own stores AVM.dat RoboRealm project, should also be used when starting again. As standart, the \ user folder are used. -> Currently you can only record one track clean without the problems there, it should give the possibility to load different maps. Also set a mark as a waypoint on the map would be a solution. This could also go ahead and continue using the voice command the robot to a target can bestimtes cards. It would be ideal for larger maps, if the map automatically zooms in or out. Important but would be a smoother control of the robot, the current system is, unfortunately, horrible ... * laugh * The search for gate Ways would be better if the robot simply turns slowly on the spot and sometimes a bit carried away here, so he finds a possibly overlooked gate. Thank you for advices I will think over about it. Can you please tell more details about your robot�s construction and experiments with AVM Navigator (some description, photos, video etc)? By the way I have two pretty videos regarding visual navigation. And it would be good if you could download latest version of AVM Navigator. It is better to see one time than to hear 100 times. here are the videos ... Once with and once with AVM Finducial track and my small software control. The images still show the robot and the operator. The motors I have set the AVM very small, faster is not so good. Thank you for update and it really looks great! My idea would be: if the ramp time or a gain factor in AVM Navigator would be adjusted, makes driving look better.